An extremely local and declining cabbage-like plant of shingle on seashores. The plant was once scattered around the Co Down coast from the southern part of the Ards peninsula to near Annalong, but is now apparently confined to a single location. There is one late eighteenth-century report form Rathlin Island. Past losses of sites may have been connected with robbing native populations for sources of plants for cultivation as a garden vegetable. A perennial plant with large blue-green cabbage-like leaves, the lower ones being large and up to about 50cm long. The flowers have four white petals and are produced in clusters; they are followed by the rounded-oval fruits. This is a long-lived perennial plant and established individuals may reach several metres in diameter. Flowering normally occurs after the plant has reached around five years of age. Flowers are small and white, sweet-smelling and pollinated by insects. They are produced from about May to August and are followed by production of rather woody, globular one-seeded fruits. When these are mature they split open and release the seeds which are capable of being distributed by sea water, although local proliferation of a colony takes place when seeds from a parent plant fall round its base and germinate close to it. In winter, the plant can die back completely but re-sprout in the following season from the rootstock. 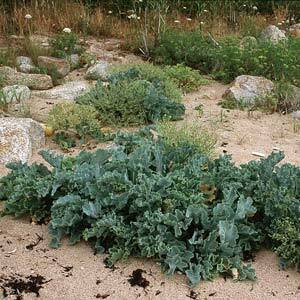 There are no other shingle plants with which sea kale could be confused. Because of its extreme rarity the chances of finding this plant are now very remote, but the possibility of it reappearing at old sites is not impossible. Shingle banks by the sea in the southerly part of the Ards Peninsula, Lecale and further south may be worth examining. It is also grown occasionally as a garden vegetable, but is much less popular than in Victorian times. It is best seen at flowering time in June. Relevant access permissions should always be sought prior to visiting any sites. In Northern Ireland, sea kale is confined at present to a single colony at Glasdrumman, north of Annalong, where it was first discovered in 1988 as a single plant. 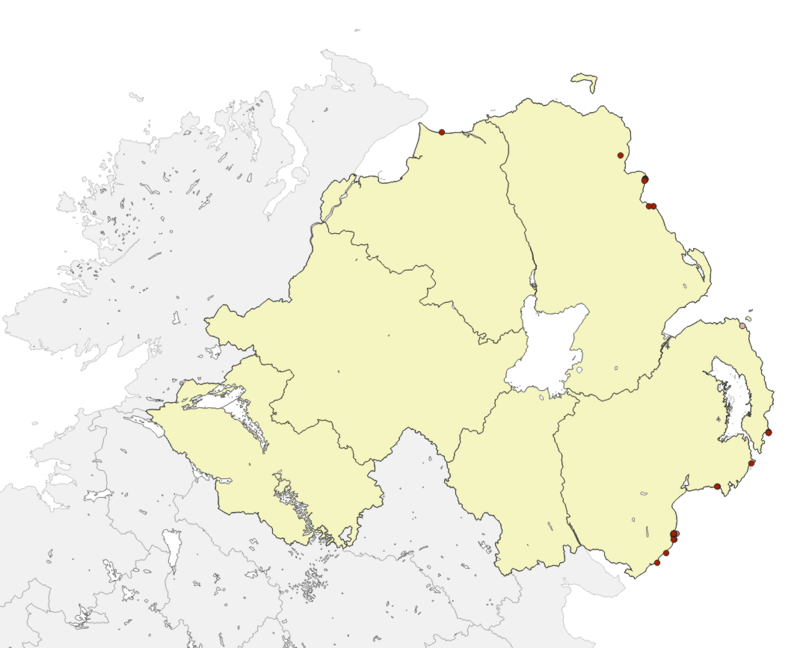 The species was recorded from three County Down sites in the period 1874 to 1920, but appeared to be extinct by 1938. In 1966, it was refound at a new site (Portavo), where it persisted until 1975. It was then not seen again until found at its current single site in 1988, which may be identical with an 1860's site. There is a report of this plant from Rathlin Island dated 1794 – the sole record outside County Down. It is reported to be recovering from a decline in the Republic of Ireland, where there are now many sites. Sea kale is protected under the Wildlife Order (NI) 1985. Disturbance of the habitat (shingle) appears to be the principal threat and reason for the plant's loss from its former sites. Such disturbance may be natural, the result of winter storms, or human. It seems likely that human interference caused the loss of the species from its Portavo site. 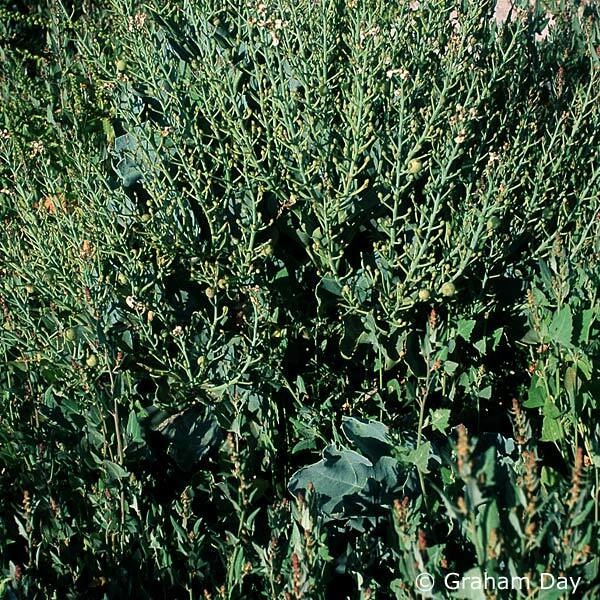 The habitat is similar to that of oyster plant (Mertensia maritima) which is also affected in the same way, and the two species sometimes occur close together, as at the current site at Glasdrumman. Another possible, but undocumented, cause may have been removal of plants into cultivation at a time when this species was a more popular garden vegetable. This seems to have been a cause of decline in other parts of its range in England and the Republic of Ireland. Sea kale has always been very rare throughout its documented history in Northern Ireland. Implementation of the Northern Ireland Habitat Action Plan for Coastal Vegetated Shingle. Manage the extant site, especially with regard to shingle removal or damage to shingle banks. If refound at other sites, ensure that the population is maintained. Hackney, P. (1992). Stewart & Corry's Flora of the North-east of Ireland. 3rd edn. Inst. of Irish Studies, Belfast. Rich, T.C.G. (1991). Crucifers of Great Britain & Ireland. BSBI Handbook No. 6. Botanical Society of the British Isles, London.